^ Administration, Township of Toms River. Accessed July 11, 2012. ^ Clerk's Office , Township of Toms River. Accessed July 11, 2012. ^ a b 2005 New Jersey Legislative District Data Book, Rutgers University Edward J. Bloustein School of Planning and Public Policy, April 2005, p. 53. ^ a b c d e f County Subdivisions: New Jersey - 2010 Census Gazetteer Files, United States Census Bureau. Accessed July 9, 2013. ^ U.S. Geological Survey Geographic Names Information System: Township of Toms River, Geographic Names Information System. Accessed March 14, 2013. ^ a b "DataUniverse - 2010 Census Populations: Ocean County", Asbury Park Press. Accessed January 2, 2013. ^ a b c DP-1 - Profile of General Population and Housing Characteristics: 2010 Demographic Profile Data for Toms River township, Ocean County, New Jersey, United States Census Bureau. Accessed February 15, 2012. ^ a b c Table DP-1. Profile of General Demographic Characteristics: 2010 for Toms River township, New Jersey Department of Labor and Workforce Development. Accessed February 15, 2012. ^ a b GCT-PH1 Population, Housing Units, Area, and Density: 2010 - State -- County Subdivision from the 2010 Census Summary File 1 for New Jersey, United States Census Bureau. Accessed January 2, 2013. ^ Look Up a ZIP Code for Toms River, NJ, United States Postal Service. Accessed February 15, 2012. ^ a b Zip Codes, State of New Jersey. Accessed September 18, 2013. ^ Area Code Lookup - NPA NXX for Toms River, NJ, Area-Codes.com. Accessed September 18, 2013. ^ A Cure for the Common Codes: New Jersey, Missouri Census Data Center. Accessed January 2, 2013. ^ Find a County, National Association of Counties. Accessed January 25, 2015. ^ Ocean County, NJ[リンク切れ], National Association of Counties. Accessed January 21, 2013. ^ a b The Counties and Most Populous Cities and Townships in 2010 in New Jersey: 2000 and 2010 Archived 2011年2月21日, at the Wayback Machine., United States Census Bureau. Accessed February 15, 2012. ^ Table 7. Population for the Counties and Municipalities in New Jersey: 1990, 2000 and 2010, New Jersey Department of Labor and Workforce Development, February 2011. Accessed July 11, 2012. ^ a b Snyder, John P. The Story of New Jersey's Civil Boundaries: 1606-1968, Bureau of Geology and Topography; Trenton, New Jersey; 1969. p. 202. Accessed February 15, 2012. ^ Morgan Quitno 12th Annual Safest (and Most Dangerous) Cities: Top and Bottom 25 Cities Overall, Morgan Quitno Press, backed up by the Internet Archive as of January 4, 2006. Accessed November 26, 2014. Listed as Dover Township, NJ. ^ 13th Annual America's Safest (and Most Dangerous) Cities: Top and Bottom 25 Cities Overall, Morgan Quitno Press, backed up by the Internet Archive as of January 5, 2007. Accessed November 26, 2014. Listed as Dover, NJ. ^ Michels, Chelsea. "Toms River fire company publicizes details of annual Halloween parade", Asbury Park Press, October 1, 2009. Accessed January 10, 2010. "It might not be in the Guinness World Records but organizers for the township's annual parade claim it is the second largest of its kind." ^ a b c "Dover Township Community Profile" Archived 2008年8月28日, at the Wayback Machine., Ocean County Library. Accessed May 16, 2012. "Most believed it was named for Thomas Luker, who came to the area around 1700 and married Princess Anne, daughter of the local Indian Chief. Only in 1992, with the dedication of a small footbridge in Huddy Park to his memory, was Thomas Luker officially recognized as the source of the “Tom” in Toms River. Over 40 of Luker’s direct descendants and their families attended the ceremony where Ocean County Historian Pauline Miller laid to rest the other stories." ^ Three Dramatic Scenes in the Closing Hours of the Revolutionary Struggle, Gen. W. H. Stryker, presentation at Doylestown Meeting, January 21, 1885. Provides a comprehensive account of the incident at Toms River in 1782 and its aftermath. ^ Multiple Property Submission List, National Register of Historic Places. Accessed August 7, 2006. ^ New Jersey and National Registers of Historic Places, Ocean County, New Jersey Department of Environmental Protection Historic Preservation Office. Accessed August 7, 2006. ^ a b History of Dover Township, Ocean County Historical Society. Accessed August 3, 2006. ^ Kreidler, Mark. "Inseparable: Little League, Toms River - The town from New Jersey is back where it believes it belongs: in Williamsport", ESPN magazine, August 20, 2010. Accessed July 20, 2011. "Just three years later, Gaynor, by then coaching his younger son Casey, took another team to the World Series -- and this time Toms River won it all, defeating an entry from Japan 12-9 to take home the championship trophy. Gaynor's team made the Series again in '99, a staggering run of three Williamsport trips in five years." ^ Dyer, Eric. "Toms River Champs On Parade 40,000 Fans Swooned Over The Young Kings Of The Little League Baseball World. ", The Philadelphia Inquirer, September 6, 1998. Accessed July 20, 2011. ^ PAST NATIONAL CHEER CHAMPIONS, Pop Warner Little Scholars. Accessed October 15, 2007. ^ New Jersey Department of Health and Senior Services, Hazardous Site Health Evaluation Program, Division of Epidemiology, Environmental and Occupational Health, & US Department of Health and Human Services, Agency for Toxic Substances and Disease Registry (ATSDR). (Sep. 1997). Childhood Cancer Incidence Health Consultation: A Review and Analysis of Cancer Registry Data, 1979-1995 for Dover Township (Ocean County), New Jersey Archived 2004年10月27日, at the Wayback Machine. ^ NJDHSS, ATSDR. (Dec. 2001). Case-control Study of Childhood Cancers in Dover Township (Ocean County), New Jersey. Volume 1: Summary of the Final Technical Report PDF 134KB Archived 2004年2月29日, at the Wayback Machine.. See also: Dover Township Childhood Cancer Investigation Archived 1997年6月18日, at the Wayback Machine.. Accessed January 31, 2005. ^ Citizen’s Guide to the Childhood Cancer Incidence Update: A Review and Analysis of Cancer Registry Data, 1979-2000, January 2003. ^ Milke, Jean. Population explosion is talk of Toms River, Asbury Park Press, November 11, 2004. Accessed January 4, 2007. ^ The 2014 Pulitzer Prize Winners - General Nonfiction, Pulitzer Prize. Accessed December 18, 2014. "In an astonishing feat of investigative reporting, prize-winning journalist Dan Fagin recounts the sixty-year saga of rampant pollution and inadequate oversight that made Toms River a cautionary example for fast-growing industrial towns from South Jersey to South China." 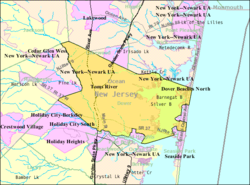 ^ About Toms River, Ocean County. Accessed August 3, 2006. ^ Toms River Now: Support the Dover Township name change, Toms River Now. Accessed August 2, 2006. ^ Dover Township Election Results, accessed November 11, 2006. ^ APP.COM - Dover is over; it's Toms River Township, November 7, 2007. Accessed November 8, 2006. ^ Romano, Jay. "Ortley Beach Journal; Secession Drive Brings Criticism", The New York Times, February 12, 1989. Accessed July 11, 2012. "Ortley Beach is one of several small communities on the barrier island that runs from Point Pleasant to Seaside Park and separates Barnegat Bay and the Atlantic Ocean. Centered on this island, Ortley Beach is bordered on the north by Lavallette and on the south by Seaside Heights, both independent municipalities." ^ Areas touching Toms River Township, MapIt. Accessed December 19, 2014. ^ DP-1 - Profile of General Population and Housing Characteristics: 2010 Demographic Profile Data for Dover Beaches North CDP, New Jersey, United States Census Bureau. Accessed May 15, 2012. ^ DP-1 - Profile of General Population and Housing Characteristics: 2010 Demographic Profile Data for Dover Beaches South CDP, New Jersey, United States Census Bureau. Accessed May 15, 2012. ^ DP-1 - Profile of General Population and Housing Characteristics: 2010 Demographic Profile Data for Toms River CDP, New Jersey, United States Census Bureau. Accessed May 15, 2012. ^ GCT-PH1 - Population, Housing Units, Area, and Density: 2010 - County -- County Subdivision and Place from the 2010 Census Summary File 1 for Ocean County, New Jersey, United States Census Bureau. Accessed January 2, 2013. ^ 2006-2010 American Community Survey Geography for New Jersey, United States Census Bureau. Accessed January 2, 2013. ^ New Jersey: 2010 - Population and Housing Unit Counts - 2010 Census of Population and Housing (CPH-2-32), United States Census Bureau, August 2012. Accessed January 2, 2013. ^ Locality Search, State of New Jersey. Accessed December 19, 2014. ^ Compendium of censuses 1726-1905: together with the tabulated returns of 1905 Archived 2014年6月29日, at the Wayback Machine., New Jersey Department of State, 1906. Accessed July 19, 2013. ^ Wilson, Harold Fisher. The Jersey Shore; a social and economic history of the counties of Atlantic, Cape May, Monmouth, and Ocean. New York: Lewis Historical Publishing. 1953. Vol. 2. Appendix B: Population Statistics. Ocean County Population Statistics. p. 1132. "Dover Township reported 1,882 in 1810; 1,916 in 1820; 2,898 in 1830 and a drop to 2,752 in 1840. In 1846 Union was created from Dover and Stafford, reporting a population of 1,759 in 1850, and Dover's population dropped in that year to 2,385. ^ Barnett, Bob. Population Data for Ocean County Municipalities, 1850 - 2000, WestJersey.org, January 6, 2011. Accessed January 2, 2013. ^ Raum, John O. The History of New Jersey: From Its Earliest Settlement to the Present Time, Volume 1, p. 280, J. E. Potter and company, 1877. Accessed January 2, 2013. "Dover contained in 1850, 2,385 inhabitants; in 1860, 2,378; and in 1870, 3,044." ^ Debow, James Dunwoody Brownson. The Seventh Census of the United States: 1850, p. 140. R. Armstrong, 1853. Accessed January 2, 2013. ^ Staff. A compendium of the ninth census, 1870, p. 260. United States Census Bureau, 1872. Accessed January 2, 2013. ^ Porter, Robert Percival. Preliminary Results as Contained in the Eleventh Census Bulletins: Volume III - 51 to 75, p. 99. United States Census Bureau, 1890. Accessed January 2, 2013. ^ Thirteenth Census of the United States, 1910: Population by Counties and Minor Civil Divisions, 1910, 1900, 1890, United States Census Bureau, p. 338. Accessed January 2, 2013. ^ Fifteenth Census of the United States : 1930 - Population Volume I, United States Census Bureau, p. 718. Accessed January 2, 2013. ^ New Jersey Resident Population by Municipality: 1930 - 1990, Workforce New Jersey Public Information Network, backed up by the Internet Archive as of May 2, 2009. Accessed January 2, 2013. ^ a b Census 2000 Profiles of Demographic / Social / Economic / Housing Characteristics for Dover township, Ocean County, New Jersey, United States Census Bureau. Accessed January 2, 2013. ^ a b DP-1: Profile of General Demographic Characteristics: 2000 - Census 2000 Summary File 1 (SF 1) 100-Percent Data for Dover township, Ocean County, New Jersey, United States Census Bureau. Accessed January 2, 2013. ^ DP03: Selected Economic Characteristics from the 2006-2010 American Community Survey 5-Year Estimates for Toms River township, Ocean County, New Jersey, United States Census Bureau. Accessed February 15, 2012. ^ Elected Officials, Toms River Township. Accessed January 25, 2015. ^ 2012 New Jersey Citizen's Guide to Government Archived 2013年5月28日, at the Wayback Machine., p. 65, New Jersey League of Women Voters. Accessed January 6, 2013. ^ a b Voter Registration Summary - Ocean, New Jersey Department of State Division of Elections, March 23, 2011. Accessed January 2, 2013. ^ GCT-P7: Selected Age Groups: 2010 - State -- County Subdivision; 2010 Census Summary File 1 for New Jersey, United States Census Bureau. Accessed January 2, 2013. ^ 2008 Presidential General Election Results: Ocean County, New Jersey Department of State Division of Elections, December 23, 2008. Accessed January 2, 2013. ^ 2004 Presidential Election: Ocean County, New Jersey Department of State Division of Elections, December 13, 2004. Accessed January 2, 2013. ^ 2009 Governor: Ocean County, New Jersey Department of State Division of Elections, December 31, 2009. Accessed January 2, 2013. ^ Toms River Regional School District 2013 Report Card Narrative, New Jersey Department of Education. Accessed August 10, 2014. "Toms River Regional School District is the largest suburban school district in the state with a population of approximately 17,000 students, twelve elementary schools, three intermediate schools and three high schools. Respective of our size, the district takes enormous pride in the neighborhood school concept providing high-quality educational programs and services to our four sending towns, Beachwood, Toms River, Pine Beach, and South Toms River." ^ Ocean County Economic Development Fast Facts, Ocean County, New Jersey. Accessed July 12, 2012. "Toms River Regional School District in the largest suburban district in New Jersey, fourth largest overall with 18,000 students." ^ District information for Toms River Regional School District, National Center for Education Statistics. Accessed June 11, 2014. ^ School Data for the Toms River Regional Schools, National Center for Education Statistics. Accessed August 14, 2014. ^ Beachwood Elementary School, Toms River Regional Schools. Accessed August 14, 2014. ^ Cedar Grove Elementary School, Toms River Regional Schools. Accessed August 14, 2014. ^ Joseph A. Citta School Elementary School, Toms River Regional Schools. Accessed August 14, 2014. ^ East Dover Elementary School, Toms River Regional Schools. Accessed August 14, 2014. ^ Hooper Avenue Elementary School, Toms River Regional Schools. Accessed August 14, 2014. ^ North Dover Elementary School, Toms River Regional Schools. Accessed August 14, 2014. ^ Pine Beach Elementary School, Toms River Regional Schools. Accessed August 14, 2014. ^ Silver Bay Elementary School, Toms River Regional Schools. Accessed August 14, 2014. ^ South Toms River Elementary School, Toms River Regional Schools. Accessed August 14, 2014. ^ Walnut Street Elementary School, Toms River Regional Schools. Accessed August 14, 2014. ^ Washington Street Elementary School, Toms River Regional Schools. Accessed August 14, 2014. ^ West Dover Elementary School, Toms River Regional Schools. Accessed August 14, 2014. ^ Toms River Intermediate East, Toms River Regional Schools. Accessed August 14, 2014. ^ Toms River Intermediate North(formerly know as Intermediate West), Toms River Regional Schools. Accessed August 14, 2014. ^ Toms River Intermediate South, Toms River Regional Schools. Accessed August 14, 2014. ^ Toms River Intermediate North, Toms River Regional Schools. Accessed August 14, 2014. ^ Schools, Toms River Regional Schools. Accessed August 14, 2014. ^ New Jersey School Directory for the Toms River Regional Schools, New Jersey Department of Education. Accessed August 14, 2014. ^ Home page, Monsignor Donovan High School. Accessed August 13, 2013. ^ School Directory, Roman Catholic Diocese of Trenton. Accessed July 20, 2011. ^ Ocean County College, Ocean County College. Accessed July 11, 2012. ^ Crane, Mark via Associated Press. "What's right in 'right of way'; Roadway devours homes, farms", The Nevada Daily Mail, March 13, 1981. Accessed September 18, 2013. "The authority finally declared the Alfred E. Driscoll Expressway project dormant last year after almost a decade of planning, legal battles and land acquisitions that totalled $17 million.... Land values have increased significantly in the past seven years and some parcels have doubled or tripled in value since the authority purchased 100 tracts of land from some 30 or 40 owners along a 38-mile strip from Toms River to North Brunswick." ^ Ocean County Bus/Rail Connections, New Jersey Transit, backed up by the Internet Archive as of May 22, 2009. Accessed July 20, 2011. ^ Ocean Ride Route Information, Ocean County, New Jersey Transportation Services. Accessed July 20, 2011. ^ Monmouth-Ocean-Middlesex Line, Ocean County, New Jersey Department of Planning. Accessed July 20, 2011. ^ R. J. Miller Ocean County Airport, Ocean County, New Jersey. Accessed August 14, 2014. ^ Staff. "Thousands flock to state chili and salsa cookoff in Toms River", Asbury Park Press, May 19, 2007. Accessed July 11, 2012. ^ Virtual Tour of the Toms River Branch, Ocean County Library. Accessed January 2, 2013. ^ Kile, III, William H. "INDOOR TRACK: ‘Bubble’ finally ready for action", Medford Central Record, January 11, 2013. Accessed August 14, 2014. "The familiar sound of the starter’s pistol rang out from the John Bennett Indoor Athletic Complex on Jan. 2 and it was a welcome sound for track coaches and fans in the area.The South Jersey indoor track and field season finally got underway last week after the Hooper Avenue facility, also known fondly as 'The Bubble,' was repaired after sustaining damage when Hurricane Sandy arrived at the end of October." ^ Bennett, Don. "County gets behind hospital's bid for heart certification", Asbury Park Press, March 3, 2008. Accessed July 11, 2012. "Three years ago, Kelly said, Community's bid was approved by all the boards that reviewed it, but was rejected by the then-commissioner of health - despite Community's being the largest non-teaching hospital in the state, with 587 beds, and its affiliation with two cardiac surgery centers: Beth Israel and St. Barnabas." ^ Staff. "An estimated 25,000 people attended the return of Toms River Fest", Asbury Park Press, August 4, 2008. Accessed July 11, 2012. ^ About Ocean County Mall, Simon Malls. Accessed July 11, 2012. "Ocean County Mall is the only enclosed regional shopping center in Ocean County, New Jersey." ^ Pellegrino, Michael. Jersey Brew: The Story of Beer in New Jersey., (Wantage, NJ: Pellegrino & Feldstein, 2009). ISBN 9780976523314. ^ New Jersey Craft Beer. "New Jersey Breweries & Brewpubs – contact info, tours, tastings and more", April 10, 2013. Accessed August 14, 2014. ^ Taylor, Clarke. "'AMITYVILLE HORROR' IN SOME NEW JERSEY HAUNTS", Los Angeles Times, November 26, 1978. Accessed January 2, 2013. ^ Reiss, Fraidy. "Students restore cannon", Asbury Park Press, "Right there in town hall, for all the world to see, the town whose slogan boasts 'Great places, familiar faces' recently began displaying a black, functional, 500-pound swivel cannon." ^ Staff. "Shooting of Blind Faith Begins", The Wichita Eagle, November 5, 1989. Accessed February 15, 2012. "Shooting has started in Los Angeles on the NBC miniseries, "Blind Faith." It is based on the Joe McGinniss book about the murder of Toms River, N.J., housewife Maria Marshall." ^ The Museum, Waterhouse Museum. Accessed February 15, 2012. ^ Holden, Stephen. "Chris Connor, Jazz Singer Whose Voice Embodied a Wistful Cool, Dies at 81", The New York Times, September 1, 2009. Accessed April 6, 2011. "Chris Connor, the great jazz singer whose lush, foggy voice and compressed emotional intensity distilled a 1950s jazz reverie of faraway longing in a sad cafe, died on Saturday in Toms River, N.J. She was 81 and lived in Toms River." ^ Feitl, Steve. "BACK TO HIS ROOTS: Frank Edgar part of fight card in UFC's return to New Jersey", Home News Tribune, November 15, 2007. Accessed December 28, 2007. "After an accomplished wrestling career — one that saw him place twice at states while at Toms River High School East and qualify for nationals all four years as an All-American at Clarion University in Pennsylvania — Edgar chose to train for the combat sport that merges numerous disciplines from wrestling to jiu-jitsu to kickboxing." ^ UFC Fighter Profile of Frank Edgar, UFC, accessed March 15, 2007. ^ Christopher, Chris. "Frazier to Cincinnati; 34th overall", Ocean County Observer, June 8, 2007. "She had to do something to honor her cousin, Todd Frazier, the former Toms River High School South standout selected 34th in the supplemental first round of the 2007 First-Year Player Draft yesterday by the Cincinnati Reds.... Todd Frazier of Toms River, right, was picked by the Cincinnati Reds yesterday." ^ Brian Geraghty, The New York Times from Allmovie. Accessed April 6, 2011. "After viewing that performance, Geraghty -- unclear after high school about where he wanted to go or what he wanted to do -- made a beeline from his home of Toms River, NJ, to New York City's Neighborhood Playhouse, where he plunged headfirst into classical theater -- and subsequently received a bid to audition for HBO's organized crime drama The Sopranos." ^ Olney, Buster. "BASEBALL; Mets Bolster Rotation in Deal for Leiter", The New York Times, February 7, 1998. Accessed February 15, 2012. "Al Leiter grew up in Toms River, N.J., rooting for the Mets on television, a die-hard with indelible memories of the 1969 World Series. Now Mets fans will be rooting for him." ^ Dremousis, Litsa. Demetri Martin, The Believer (magazine), February 2006. Accessed June 23, 2007. "The son of a Greek Orthodox priest (note: Orthodox priests can marry prior to ordination) and a nutritionist, Martin grew up with his brother and sister in Toms River, New Jersey." ^ Vice Admiral Charles E. Rosendahl Collection Archived 2012年9月5日, at the Wayback Machine., University of Texas at Dallas, Accessed June 23, 2007. "1960: Retired to Toms River to write and to organize Lighter-Than-Air Museum Association at Lakehurst." Dover Township: A Brief History - from the Asbury Park Press.